The newest names trademarked by Samsung might create a little bit of confusion among consumers who are looking to buy the South Korean company's products. The Galaxy Watch and Galaxy Fit names now belong to Samsung and that might not be a problem if they wouldn't be saved for the naming of wearable devices. As many of you probably know by now, Samsung uses the Gear moniker for its wearables, so the fact that it's now trademarked completely different names is a bit weird. It probably suggests that Samsung may want to unify the naming scheme of its smartphones and wearable devices. That would be kind of a radical decision and, since it's not the first time Samsung is renaming its wearables, it will probably confuse many consumers. The good news is naming a smartwatch Galaxy Watch makes much more sense than calling its Gear S.
Samsung's next wearable devices are expected to go official this fall at IFA 2018. We know for sure the South Korean company will launch a brand new smartwatch, but a fitness band is in the cards as well, especially with the new trademark that's been filed by Samsung recently. It's better to be safe than sorry, so if they're planning to call it Galaxy watch, which makes a lot more sense with the rest of their product line, then they should go ahead and get the patent in advance. - Samsung Galaxy smartphones. - Samsung Galaxy smartwatches. I think it's a pretty logical naming scheme. Get why they changed it but, I like Gear S better. Samsung appears to be going in a new direction as far as the branding for its wearable devices is concerned. New trademark applications have surfaced online which reveal the Samsung Galaxy Watch and Galaxy Fit monikers. This suggests that the company might be thinking about retiring the “Gear” brand for its wearable devices and in favor of bringing these devices to the Galaxy. The company has long used the Galaxy branding for its smartphones and tablets so it would make sense to unify the brand and bring wearable devices under its umbrella as well. Many would argue that this should have been done a long time ago and while it’s still not confirmed if Samsung is going to do this, it would make sense for the company to do so. 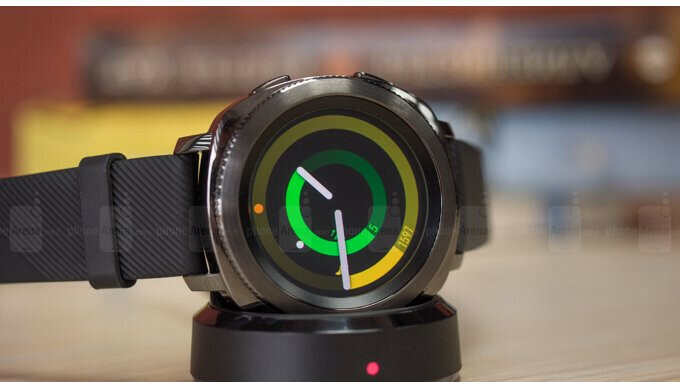 Samsung Galaxy Watch and Galaxy Fit A new trademark application published by the USPTO has revealed the Galaxy Watch moniker which on the face of it could only be used for a smartwatch. We have already reported exclusively that the company has started developing the Gear S4 and that it’s going to be launched later this year. There’s a possibility now that the Gear S4 might be launched as the Galaxy Watch. The trademark application doesn’t reveal much about the device other than that it’s going to feature LTE and NFC. We also reported exclusively a couple of weeks ago that Samsung is testing the LTE Gear S4 in the United States. Whether or not the shift to the Galaxy moniker means that the company will be ditching the Tizen OS in favor of Wear OS for its new smartwatch remains a mystery for now. There have been no rumors so far which would suggest that Samsung could shift to the Android-based wearable platform for the Gear S4. Samsung might bring other wearable products under the Galaxy brand as well. The USPTO has published another trademark application for the Galaxy Fit which is meant for a fitness tracker like the Gear Fit 2 Pro. The company isn’t expected to announce new wearable devices until the second half of this year so might hear more about them at the IFA 2018 convention in Berlin this August. Did you just copy & paste all that?? The name change would make sense if Samsung employs WearOS on the new models. The Galaxy name for their lineup is tied to the use of Android as OS, so if the new smartwatch models use Wear OS, an Android variant specific to smartwatches, the use of Galaxy in the name is only logical.